The Girlie Show was the first tour to span over 5 different continents, visiting several new territories such as Australia, Argentina, Brazil, Mexico, and Israel. However, this also meant that the tour was limited to only 2 cities in Europe and 3 cities in the US. In total, the Girlie Show comprised of 39 shows in 12 different countries, kicking off in London on September 25, 1993. Most of the shows were in large stadiums. Inspired by the painting "Girlie Show" by Edward Hopper, Madonna's fourth tour concentrated on her most recent album Erotica, while also playing some of her 80s hits. The Girlie Show saw many collaborators returning from the Blond Ambition Tour: Niki & Donna on backing vocals, Carlton as dancer, Christopher as Production designer, and several band members. The number of choreographers started growing. Costumes were done by Dolce & Gabbana. The Sydney show on Nov. 19, 1993 was recorded for commercial release. The concert was directed by Mark "Aldo" Miceli and released on VHS and Laserdisc by Warner and Maverick Records on April 25, 1994 with the title 'The Girlie Show: Live Down Under'. The release scored a Gold certification in the US and Platinum in the UK. In 1995, it received a Grammy nomination in the category Best Long Form Music Video. 'The Girlie Show: Live Down Under' was re-released in DVD format in 1998. 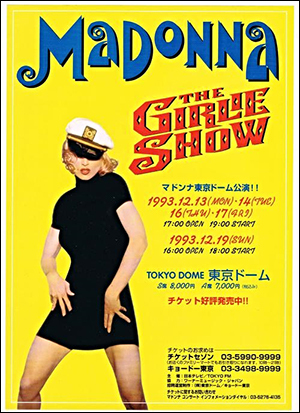 The show in Fukuoka was also recorded and shown only on the Japanese TV special 'Madonna Live in Japan 1993 – The Girlie Show'.